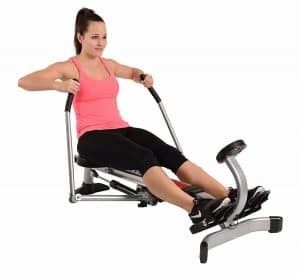 The Stamina Body Trac Glider 1050 Rowing Machine is first of all very affordable and popular with over 2000 Amazon customer reviews, 85% of which are positive with an approval rating of 4 out of 5. No one will be aware of this approval rating and not be tempted to look it up especially if the person is on a budget, and of course it worth looking up. You should also have it at the back of your mind that a rowing machine that is this cheap and popular has its drawbacks. That is the essence of this review, to let you know the pros and cons of the Stamina Body Trac Glider 1050 Rowing Machine and let you decide if the pros work for you and can turn a blind eye to the cons or if the cons are a deal breaker. Whichever way you will soon be able to make that decision when you are done reading this review. 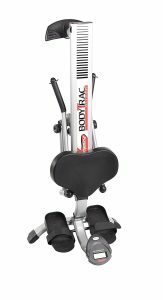 Basically this rower a good unit considering the price it is being sold for and it still delivers in providing good workouts. It provides good cardiovascular endurance and also helps to sculpt and strengthen your back, shoulders, arms, quads, hamstrings, and glutes. The frame is made of steel and supports up to 250 pounds maximum user weight capacity. The rowing beam is aluminum but it holds up because no reviewer has ever complained of having a problem with it. However, the biggest problem of this machine is the pivoting mechanism under the rower which has Plastic bushings. Being that they are plastic they tend to wear out fast if a user is very hard on it by using high resistance or over time it will be a problem. They should have use metal bushings for that purpose so that it will last longer. But then, that will also increase the price with a few more dollars and it will not be getting spoiled easily. Being said, this is one of the most popular rowing machine available that it even made it to our best rowing machine list. Below is a rowing machine comparison table that you could still check out if you feel like doing so and do not also forget to look up our reviews on the best rowing machines as well. The frame is made of steel and supports up to 250 pounds maximum user weight capacity. It can hold up because there has never been a complaint that the frame broke. It is also very sturdy and does not unnecessarily move or wobble during an intense workout. Some users have acknowledged of having this rower for over or nearly 10 years which is a good thing but have issues with fixing it when it broke down because it was either the parts the manufacturer sent did not match or they did not send the parts at all. It possesses an adjustable hydraulic resistance system that is fairly effective and has a manual control knob with 12 resistance levels. Most users are fine with the resistance but some complained about it being everywhere, which means that sometimes it gets harder and at other times it becomes soft with almost no resistance. And this usually happens as a result of heavy use because the resistance system has only a single piston that provides the resistance. Therefore, after a few minutes of heavy use, the resistance drops with almost no resistance but rebounds when the user has slowed down. This problem may not be a general problem since most or majority of the users have not complained but rather have applauded the function of the resistance and how it has really helped them to sculpt their body and loss some belly fat. Moreover, its overall operation is smooth and silent that a user can even choose to watch the TV or listen to music without having noise from the rower interfering. This also means a user does not have to also worry about disturbing the family or neighbor each time he wants to work out. It has got a very good oversize and well-padded seat that is going to make you comfortable during a workout and not get bored. It is very good considering the price of the rower itself. There are rollers underneath the seat that enables it to slide during a workout; these rollers have the tendency to wear out over time of constant use. If you intend to use the machine for a longer workout session then it might be wise to add a cushion on the seat in order to provide the comfort you will require in long run. The console is a basic one and very easy to use. It has good readability as long as you are using it in a well-lit room or location otherwise it will be very difficult to view the metrics because it is not a backlit type of a monitor. 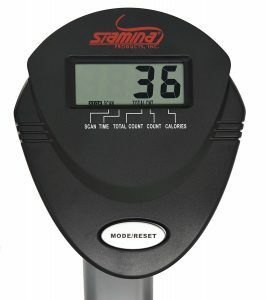 The monitor displays workout data that enable the user to monitor his workout progress; it displays metrics such as time, stroke count, and calories burned. Since the console/monitor is a basic one it doesn’t have many features such as preset programs or the ability to store workout performance. And we are not surprised at what we found because this is an inexpensive machine and shouldn’t expect much. So far, there are no complaints about the monitor’s function, maybe the users never cared considering the amount the machine is sold at. 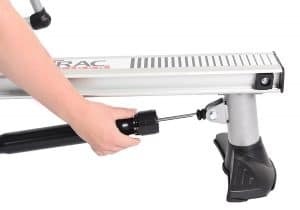 The Stamina Body Trac Glider 1050 Rowing Machine is considered a compact machine with a footprint size of 46 inches by 23.5 inches and weighs about 35 pounds. It is also foldable which means it can take up lesser space for storage. Basically, storage is pretty convenient but it is advised to keep the machine close to where you plan to use it because even though it weighs just 35 pounds it can be pretty heavy for some people and it does not transport wheels to aid in relocation process as well. The footrest is large and accommodating except for the straps that do not allow users’ foot to fit in without slipping out all the time. There is a sort of unified complaints about this problem; the footrest has 2 straps instead of 4. Many users have complained of having a hard time getting their feet strapped in. Especially, this interrupts their workouts because they have to stop every now and then to get the feet strapped in again each time they pop out. However, these may not be a deal breaker or a big deal to so many people. And moreover, it can be remedied by either looking for the shoes that will fit in just fine or replace the straps with thicker Velcro straps. 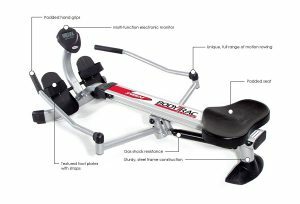 The Stamina Body Trac Glider 1050 Rowing Machine is certainly very popular partly because of its price and partly because of its overall performance. There are over 2000 Amazon customer reviews most of which are positive and the users have expressed their satisfaction with the machine not without one or two complaints but are satisfied. It currently has an average of 4.0 out of 5 approval rating after the reviews have been summed up, which means over 80% of its users love it and would recommend it. It has a monitor that displays workout data such as speed, distance, strokes, calories burned, workout duration. The foot straps do not secure the feet very well- most users have this to complain about but there are two ways around this problem, first, is to find a shoe that fits in properly or replace with Velcro straps. 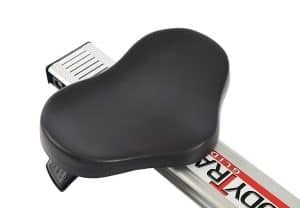 The seat does not provide comfort for a longer ride- which means if you intend to use this machine for a longer period of a workout then you might want to consider improving the seat by adding a cushion or using a seat cover. The pivoting mechanism is said to be a problem especially over time or if you are a hard user because the bushings in it are plastic instead of metal. The company should have made it be metal instead, but we get it, that will make the price of the machine to go up and will not break down often to be replaced. Nevertheless, many users have declared to have used this machine for a long time. The shipping cost and delivery time of this machine varies and depends on the retailer you are purchasing from, however; Amazon provides free shipping and delivery and usually takes about 3 to 5 days to deliver the product at your doorstep. The machine is also well packaged for any mishandling and dropping. To assemble this rower is pretty easy as many users have expressed satisfaction on how they were able to assemble in less than an hour. The assembling manual is not perfect but enough to guide you through the process of assembly with illustrations. The Machine does not require any frequent maintenance except to wipe it clean of sweat and dust. However, as time goes on it may require some level of maintenance that will warrant the replacement of some parts such as the pivot bushings and the seat ball-bearings. What we love about the Stamina Body Trac Glider 1050 Rowing Machine is the fact that it is inexpensive and considerably durable. This is an ideal machine for home use especially those that cannot afford the high-end rowing machine. The machine has 2 outstanding advantages which are affordability-price-wise it is very inexpensive and most individuals that wish to acquire a rowing machine can do so regardless of how low they may be on a budget. The other advantage is that fact that the user will be able to use it and achieve physical fitness and lose tons of calories. Moreover, it is a compact and foldable machine that can fit in just fine in a small room. This will also eliminate the cost you spend on gym registration fees and also provide convenience-because you don’t have travel to the gym anymore which also eliminates the gas money if you have to drive, and you don’t have to worry about the weather too because you can workout whenever you desire to do so. We have stated above the drawbacks of this machine which is the pivot plastic bushings, the footrest straps and the seat not very comfortable for longer workouts. What do you expect from a machine of this price range, perfection? Even the expensive machines do have their drawbacks too but the question is, are these drawbacks a deal breaker? We don’t think so because if they were many users wouldn’t have purchased it let alone recommending it. Leave a comment below if you still have any questions and we shall be glad to respond accordingly.